have anybody replace the fan on their gamecube? my is going out and i am thinking about sticking a "FRACTAL DESIGN SILENT SERIES R3 50MM" fan but will the gamecube power be enought to power the this fan? i know the fan have three pins but i can used the ground and power then the yellow control wire i don't need to used. just need to know if ok to do this hack/mod of the ran. In other words, pretty much any fan designed for use in a PC will work. 50mm is best though, because it'll fit without having to butcher the case. yeah i seen picture's of it and my god. i don't want my console to look like a frankenstein monster. going to do the mod this weekend but i did mod my heatstink to sit flush on the cpu/gpu and ram memory with fresh thermal paste after i notice my fan was not spinning as fast it was. but my question is why nintendo didn't put the fan on the heatstink or put two fans of push and pull set up of the console since their two vents already on the console? I wouldn't recommend that you do that. 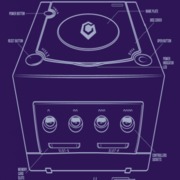 The gamecube is a very low power device compared to modern desktop PCs and doesn't need much cooling capacity. You can easily run it without the fan for a while. The heatsink will get toasty though. i did some testing and the power that is going out the fan input isn't enough to power two fans so i'm just going to replace the fan with the fractal fan. one of my engineer friends at work told me if i can build a board with couple of caps to hold and deliver the power of both fans i be ok but i'm not skillful enough to build something like with the caps and power modular on a pcb board. You should have at least half of the 39W from the power brick available to power the fans, I'm not sure how that's not enough. i'm testing it where the fan input is at not the power deliver on the bank of the board. Yeah, but that's connected straight to the power brick. Oh yeah of course if you put them in series you're going to run into trouble.